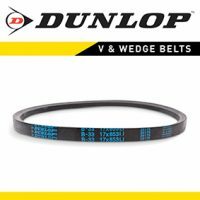 We supply high quality V-belts manufactured by Dunlop BTL. The range includes all sizes of Classical Belts, A, B, C, D, SPZ, SPA, SPB and SPC. We also supply timing belts and poly-v-belts. Applications include pump drives, fan drives, agricultural and industrial machinery drives. For precision drive control we also supply Syncroflex timing belts manufactured by Transdev. Syncroflex belts are wire reinforced and can also be coated with a variety of different top surfaces when used on packaging machinery and conveying applications. We provide technical support on the correct selection of vee belts and syncroflex belts for new applications. For more information please call us on 028 92674137 or email us with details of your enquiry. All stock items can be collected at our trade counter or dispatched to any UK or Ireland address on a next day or 3 day service. You may also be interested in v-pulleys and taper lock bushes when using this product range.